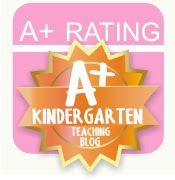 Kindergarten Kel: What I've Been Up To and a Freebie! 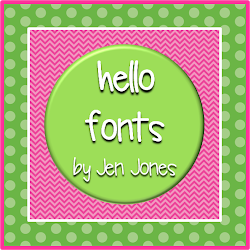 What I've Been Up To and a Freebie! Last week was busy, busy. We didn't have school Monday and I had a sub Tuesday while I attended an awesome workshop on Brain Based Learning. The presenter was Eric Jensen. If he is in your area, I would recommend going, especially if you in a high-poverty, high-needs school. Great workshop, but this cut the week down to three days and I wanted to fit all sorts of fun snow/snowmen/winter projects in, since I have been seriously lacking in art projects lately. I am just beginning to remember to take photos of all of that my lovely class does. This past week, the kids wrote directions for "How to Build a Person." while I was away. This was good practice with writing a complete thought, which is one of the tougher MN kindergarten standards. I saw the original idea on Pinterest, but tweaked the sheet a little bit. I wish they would have turned out better, but the kids did okay, considering they were with a sub. Click below to get a google docs version of this sheet! This week, we also read the story Snowmen at Night and painted our own snowmen at night using marshmallows as paint stampers. I had found that idea on Pinterest, but not sure of the source! Sorry! We will write about our snowmen next week. Anyway, the kiddos learned to cut out their own snowflakes, which was a big ol' mess of teeny, tiny scrippy scraps (sorry, custodians). They taped them on a piece of blue construction paper. 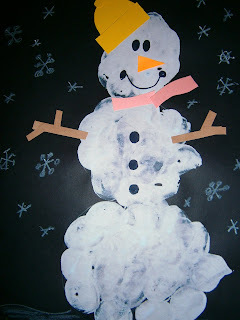 Then, they sponge painted around and on top of the snowflake, using it as a stencil. After the paint dried, we discussed exciting, interesting words that could describe a snowflake. This was a great "next step" in the writing process for some of my more advanced writers. We brainstormed the list of adjectives on chart paper. Then, all of the students used two words to describe their snowflake! I am still not sure about posting student work on this sort of a online medium, so here is my example. Thanks to my old co-worker, Melissa, for that great idea! I haven't forgotten about my 100th Day ideas either...just took some pics and am getting my thoughts together on that for tomorrow! Cute :) I'm excited to see the fun things you post here! I just found your cute little blog and I became your newest follower! I'm Kelly. I'm a kindergarten teacher from Minnesota. This is my fifth year teaching and all have been in the wonderful world of kindergarten! I got married this past to July to the best man in the world and we just adopted our puppy, Kona. Life is great! NWEA MAP Data Progress Trackers with a Freebie! Easter Egg Hunt With a Twist! Hurricane Florence & A Friday Freebie! Easy Back To School Team Mate Gift! My Very Own Give Away! ©Design by Christi. Simple theme. Powered by Blogger.